Team DNA Nightclub Titans Ladies: Coach Carol O'Connor, Mary Grealish (c), Lelia O’Connor ; Barbara Trant, Grainne Conneely, and coach Harrison Deneka. Front, Alexi Baude, Katie Coughlan, Roisin Sweeney, and Kate Connaughton. After 15 seasons the Titans Ladies "Team DNA Nightclub" hosted a weekend challenge against the The Mustangs of Mayo. 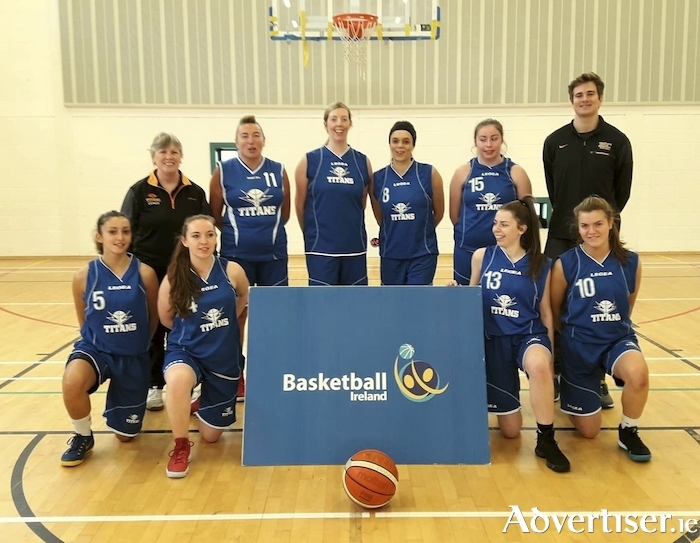 Titans' new-look squad took the game to the Mayo women with no shortage of confidence, winning the first three quarters, thanks to fine three-point shooting from Roisin Sweeney and Katie Coughlan. The Titans enjoyed some strong inside play from the experienced Barbara Trant, who hit the opening eight points. The fast paced and entertaining game resulted in Mustangs Siobhan Kilkenny poducing an exhibition of finishing under pressure, showing the Titans why she is in the NCAA's Manhattan Colleges Hall of Fame as she led her side to a 54-46 win.